Classifying things is the starting point for almost all scientific fields – from flowers to fundamental particles. Once one has classes the next step is to find subclasses, and then sub-subclasses. Finding correlations between different classification schemes, then, often leads to significant understandings. Neutron stars are not stars in the normal sense. They are remnants composed entirely of neutrons left after a star larger than the Sun, but not too large, explodes as a supernova at the end of its life as a star. There are different types of both neutron stars and supernovae. Consider neutron stars first. When a star whose inner core is more massive than the Chandrasekhar limit – about 1.4 M⊙ (M⊙ denoting the mass of the Sun) – exhausts its nuclear fuel it collapses as a supernova because it is too heavy to support itself through degeneracy pressure. If the material remaining after the explosion is less than about 3 M⊙ (the Tolman–Oppenheimer–Volkoff limit) the remnant is a neutron star. Otherwise the result is a black hole. Typically, the total mass of the progenitor of a neutron star is in the range of 5 to 15 M⊙. Since a neutron star can no longer release energy from thermonuclear reactions, it may radiate very little electromagnetic energy. Consequently it may be rather difficult to detect, like a black hole, unless it’s a member of a binary system, so that there are visible gravitational effects on the companion. However, some neutron stars may have energy sources that allow them to emit electromagnetic radiation at wavelengths all the way from radio to X-rays or even gamma rays. If the neutron star also has a strong magnetic field, such emissions may be observable in periodic pulses occurring at frequencies from a thousandth of a second on up. In this case the neutron star is a pulsar. There are different types of pulsars too, depending on the energy source. 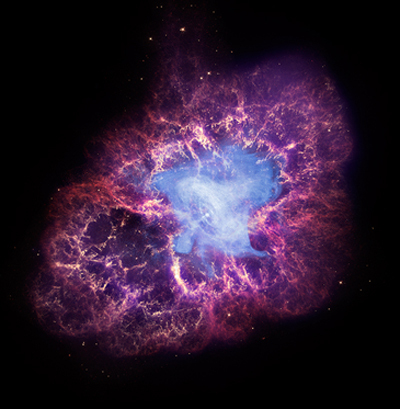 The Crab Nebula is a pretty strange crustacean. It’s a supernova remnant, from a supernova whose detonation was seen on Earth in 1054 CE. The explosion left behind a rapidly spinning neutron star and a large quantity of ejected matter that’s still expanding away from the blast site – and putting on an impressive show in optical and many other wavelengths. And now very high-energy gamma-ray pulses – less energetic than the flares, but still with energies up to 400 GeV – have shown up, associated with the central pulsar itself, which spins and pulses about 30 times per second. Normally, energetic X-ray and gamma-ray photons are generated from high-speed charged particles in a strong magnetic field, by the process of synchrotron radiation (also known as “curvature radiation”). But that appears to be ruled out in this case, since the energy limit on gamma rays that could be produced by this process is about 100 GeV. The new Science paper packages up 107 hours of Crab Nebula observations spread over the course of four years. When the data was analyzed, a clear pattern of pulses became apparent at energies above 120GeV, and the timing of the pulses lined up nicely with observations at lower energies made using the Fermi space telescope. The object there is pulsing at much higher energies than any previously detected. The findings have a number of implications. For starters, they clearly demonstrate that the predictions of exponential decay in pulse energy, those based on observations of other pulsars, aren’t happening here. Instead, the fade-off at higher energies follows what’s called a “broken power law,” with a far more gradual tailing off. The results also allow the authors to estimate the distance from the neutron star to the source of the gamma rays: between 10 and 40 stellar radii from the surface. If the process responsible for the gamma rays isn’t synchrotron radiation, what is it? The research paper suggests inverse Compton scattering, which involves high-energy particles transferring some of their energy to lower energy photons. But there’s as yet no evidence to confirm the nature of the process. It’s not even known whether a single process accounts for most of the gamma-ray flux, or instead different processes are responsible for the lower and higher energy portions. Whatever is happening in the Crab Nebula, it’s of more interest than simply a curiosity of that object. There could be some connection with the still unknown mechanism in which ultra-high-energy cosmic rays are produced. There might even be new phenomena, such as a minute dependence of the speed of the highest-energy photons on their energy. Supernovae are spectacular but fairly rare events, at least on the human time scale. In our own galaxy, only 5 have been seen (necessarily by the naked eye, before telescopes were invented in 1608) in the last 2000 years. Since there have been none in our galaxy when any telescopes were available to study them, let alone the sophisticated instruments we have now, it’s not very surprising that there’s a lot that isn’t known about how these stellar explosions occur. We do know that the are several types of supernova that can be distinguished by properties of their spectra (if they are close enough to Earth for spectra to be obtained). The most basic distinction is between supernovae that have hydrogen lines in their spectra (Type II), and those that don’t (Type I). Further subdivisions are possible, but the most important is between subtypes of Type I that have a prominent line due to silicon (Type Ia), and those that don’t (Type Ib and Type Ic). For various reasons, Type Ia supernovae are especially interesting. One is that at their peak they have a fairly uniform intrinsic brightness (absolute magnitude -19.3, in the somewhat peculiar way that astronomers measure brightness). All other types have absolute magnitudes that vary over a range of about -17 to -18.5. One unit in this scale corresponds to a factor of 2.51, so for example a supernova of absolute magnitude -17 is only about 10% as bright as the standard Type Ia supernova. The fact that all Type Ia supernovae have nearly the same absolute magnitude is what makes them useful as “standard candles” to measure cosmic distances. That Type Ia supernovae have this uniform intrinsic brightness has been explained by a model in which a white dwarf star of mass less than 1.38 solar masses (the Chandrasekhar limit) gradually (or perhaps suddenly) exceeds this limit, resulting in an explosion that destroys the star. Almost all other types of supernovae can be explained as occurring when a very massive star (more than 9 solar masses) runs out of nuclear fuel, resulting in a “core collapse” since the whole mass of the star can no longer be supported by the pressure of nuclear reactions. Two more detailed scenarios have been proposed for circumstances leading to a Type Ia supernova. One involves a binary system with one white dwarf and one normal star, portions of whose matter are gradually drawn off by the white dwarf. The second involves a binary system of two white dwarfs that eventually merge, as gravitational waves slowly dissipate their orbital kinetic energy. Historically, astrophysicists have favored the first scenario, though with rather little actual evidence. Surprisingly (or perhaps not, since white dwarfs aren’t very luminous stars), it has never been possible to identify a progenitor for a Type Ia supernova – all that have been observed with telescopes are in other galaxies. Neither has it been possible to detect another star, afterwards, at the event location, which would be the remaining member of the binary pair. But now research has just been published that provides evidence, rather indirectly, for the second scenario, in which Type Ia supernovae in fact result from the merger of two white dwarfs. A new survey of distant Type Ia supernovae suggests that many if not most of these supernovae – key to astronomers’ conclusion that dark energy is accelerating the expansion of the universe – result when two white dwarf stars merge and annihilate in a thermonuclear explosion. Evidence that Type Ia supernovae are caused by the merger of two white dwarfs – the so called double-degenerate theory – has been accumulating over the past two years, based on surveys by the Hubble Space Telescope and others. Before, astronomers favored the single-degenerate model: the idea that Type Ia’s result from the explosion of a white dwarf grown too fat by feeding on its normal stellar companion. So, if all Type Ia events look so much alike, in spite of different models that could explain them, and if it’s difficult or impossible to observe directly what the system was like before the event, just how does the research reach its conclusions? The reasoning is somewhat indirect, but ingenious and not that hard to follow. Astrophysicists have gradually been refining a system of classification for supernovae. The most basic characteristic of interest is whether or not there are spectral lines that indicate the presence of hydrogen. If these lines are absent, the supernova is Type I, which implies the progenitor star was rather old and had used up all of its hydrogen. If there are lines for hydrogen, the supernova is Type II. In this case, the supernova more likely was a very massive star which collapsed because nuclear fusion in its interior was no longer sufficient to support the weight. Further subdivisions within each type are possible, especially in the Type I case. If there is a certain type of line from ionized silicon, the supernova is Type Ia. If there is no silicon line, but a line from helium, it’s Type Ib. Otherwise, it’s Type Ic. It is hoped that these subdivisions reflect characteristics of the progenitor that culminated in the supernova, but there’s still a lot of uncertainty about the mechanisms involved in various cases. Type Ia supernovae are of particular interest, since observations of relatively nearby examples show that most events have a predictable intrinsic luminosity. This makes them very useful as “standard candles“. Most models of Type Ia supernova ascribe the event to hydrogen-depleted white dwarf stars that have exceeded the Chandrasekhar limit of about 1.38 solar masses because of accretion of matter from a companion star. It’s not clear how ofter this results from mergers between two white dwarfs, or simply from matter drawn from another star that survives the event, though the latter model has generally been preferred.